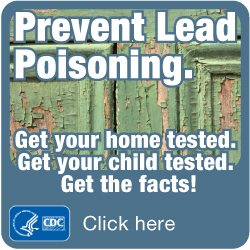 Happy Lead Poisoning Prevention Month! Last week we learned about lead found in Indian spices and it reminded us that lead poisoning is a very serious issue. Most of us think that lead poisoning can only come from eating paint chips, but that is far from the case. If your home was built before 1978 it could have lead paint that enters your indoor environment--and potentially your body--from lead dust when you open and close doors and windows. Where else can lead be found? Lead was found in jewelry, candy, school supplies and Halloween costumes in 2012. If you need help eliminating lead paint from your home, please contact Alliance Environmental Group. Our trained technicians can remove and dispose of all traces of lead without contaminating your home further and following all regulations and industry best practices. Don't take chances with lead! Call Alliance!